Woodworker’s Supply introduces the Woodtek One Hand Bar Clamp, which allows users to do a variety of tasks with one hand, including clamping or spreading. The quick adjusting jaw is controlled by a squeeze of the forward trigger, freeing up the user’s other hand for positioning of work pieces. The clamp is designed to release in seconds with the push of the smaller trigger located inside the hand piece. The end jaw can be quickly repositioned on the opposite end of the bar to make this clamp into a spreader, adds Woodworker's Supply. 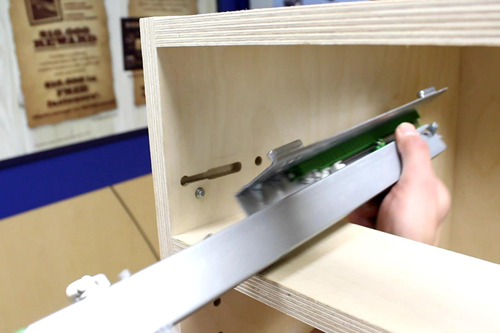 The clamp can be used in a variety of projects including cabinet drawer boxes, trim molding and for hold-downs when machining. It features a high-impact plastic handle grip and trigger designed to fit in the palm of a hand. The extra cushion of the built-in clamp pads is designed to avoid marring of work pieces. The One Hand Bar Clamp is available in 6”, 12”, 18”, 24” and 36” capacity lengths with a throat depth of 2 ½”.